Doctors have been forced to remove the lower part of sidecar star Nick Crowe’s right arm and insert donor bones in his right leg following his crash at this year’s Isle of Man TT. Crowe and passenger Mark Cox, who has also had to undergo bone insertion surgery, had an accident at Ballacob during the second Sidecar TT and a fundraising initiative has now been set up to help the pair buy the equipment needed to establish as normal a life as possible. "There has been all sorts of speculation and concern about Nick’s injuries and operations. I can confirm that Nick has had four operations so far, one of which was to remove his lower right arm, as the damage to this area was extensive and was also causing issues for the recovery of some of his other injuries. Due to the extensive damage to his right leg, Nick has also had two donor bones inserted and we now hope that his own bones will knit well to those over time. His knee was also very badly damaged and we hope that this may be semi-functional in the future, but it is too early to say at this point. These operations have been successful, although further operations over the coming months will be necessary. Nick’s other fractures are now beginning to heal well and with his intensive physiotherapy, Nick is now able to at least be mobile at times by being pushed in a wheelchair and has amazingly walked a few steps, obviously though with the external frame around his leg. "The hospital and the whole surgical team have been outstanding and when you stand back and actually reflect on what they’ve done, achieved, and still plan, the whole thing is like science fiction and we have no words sufficient to express our gratitude and amazement for the skill and care of the surgical and nursing team. "Nick has two main focuses. His first is to recover as quickly as possible and get home. The second, but also I think a driving force of his first aim, is to rebuild his HM Plant Honda sidecar. He knows most people would see it as a pile of scrap but he knows he can rescue it. Nick has looked at all the photos of the damage and knows exactly what he wants and needs to do to get it to show condition, but with an engine, and has already started speaking to friends and racing colleagues in order to help him prepare and do this. Louis Christian of LCR Engineering has offered to rebuild the sidecar chassis free of charge, which made Nick’s day! Nick said that this year’s sidecar is the best he’s ever ridden and he wants to restore it for that memory. "Nick has up and down days but the fighting spirit we’re seeing in him over his injuries and recovery is that of a true racer. I’m amazed by Nick and in awe of this guy in how he is taking each day as it comes and facing everything he’s had to contend with, with such spirit and determination. Those are two qualities in him we now value more than ever as we know those are the qualities, along with the great medical attention, that got him through those first critical hours and are aiding his slow, but steady recovery." Mark Cox’s fiancee Amanda added: "Mark spent the first few weeks following the accident in Noble’s Hospital on the Isle of Man, where his condition stabilised well. He was then transferred to Liverpool where he underwent two operations in his first week there, on his left leg and ankle. As a result of the injuries, Mark’s left leg is four inches shorter than it should be and another operation is planned in the next few weeks that will hopefully lengthen his leg, although it is not certain this operation will be successful. "If not, a further operation may be needed for a donor bone to be inserted. Mark’s ankle will need further re-constructive surgery and he’ll also need an operation to repair ligament damage to his left knee. The fractures to Mark’s pelvis and right hip are now beginning to heal well, having been repositioned, plated and pinned, as is the case with his right arm as well. "Mark has been having intensive physio and will continue this for the next few months, although he and us are pleased he was recently moved to a London hospital, so at least is now closer to home and his family. He hopes to be able to get into a wheelchair in a few weeks and then work towards getting on to his feet. "The determination and courage Mark shows daily is nothing short of inspiring and he’s so humbled and grateful by everyone’s efforts, support and well-wishes, both for him, but also for me and our children. Thank you all again." Both families would like to thank all those who organised and took part in the generous fundraising activities on the Isle of Man, to include a sidecar pull around the Island, an auction, an island quiz with pubs around the island connected by a website, and a golf tournament. A UK fundraising event is now being organised by Nick and Mark’s sponsors and takes place on Friday 21 August at the Yorkshire Suite, behind the Golden Lion Hotel in Northallerton, DL7 8PP. 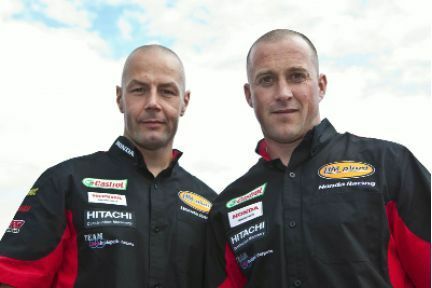 A number of TT riders are hoping to attend the event, including Honda’s dynamic road racing duo of John McGuinness and Steve Plater, as is Ian Hutchison and Guy Martin, with more TT solo and sidecar riders still to confirm. An auction and raffle will enable those attending to win some great TT and racing memorabilia, as well as non-motorcycling, but exciting, goodies! The evening will kick off at 8pm and will run until late, with entertainment throughout the evening. Tickets are £10 each and entry will be by ticket only, which can be booked by calling Emma Hudspeth on 01969 625111 or Eve Vanner on 07518 021137.